When only one man will do. There’s the best of the best, and then there’s me, the best of the best of the best. I'm a soldier, a special forces operative with over a hundred successful missions behind me, or at least I was, until a mother and child died on my watch, and I forced myself into retirement, promising I’d never put innocent people’s lives at risk again. There is nothing that can get me back into the field except the one thing I never expected to lose in the first place: Ruby Anderson. She walked out on me five years ago, and I haven’t heard from her since. Now she’s in serious trouble, time’s already running out, and I'm the only one in a position to help her. I won’t be able to live with myself if I lose her again, but the only chance I've got of saving her is doing what I promised I wouldn't do, by getting back into the field. It’s an impossible choice, and a suicide mission, but when it comes down to extremes, there isn't anyone better qualified. At the very least, she owes me a kiss goodbye. The last person I want to be thinking about right now is Jaxon. There is a very good chance I'm not going to make it out of here alive, so the last thing I want to be doing is wasting my time on him. His perfect abs, his unbelievable arrogance, his swollen ego. I've survived perfectly well for the last five years without him, and there’s no way I'm going to give in now. They might have me bound and gagged, there might be twenty heavily armed fighters between me and freedom, this might be the very situation he’s trained his entire life for, and there might be a secret I haven’t been able to bring myself to tell him, but even so, he’s out of my life for good now, he has no idea where I am anyway, and there are much better things for me to focus on. I left Jaxon for a perfectly good reason, and there’s not a single one that would make me look back now. Not even if I need him, more than anything else on this earth. This is a steamy, full-length, bad boy romance with a happy ever after and absolutely no cheating. For your reading pleasure, I have included two additional novels: Donkey and Donkey Doubled. 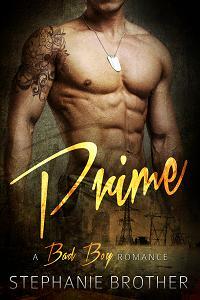 Prime is 50,000 words and ends approximately a third of the way through the book.